When a shock wave from a solar storm hits the Earth?s protectivemagnetic bubble, it creates highly energetic particles dubbed ?killerelectrons? that can be dangerous to satellites. During solarstorms, the number of killer electrons in the radiation belt grows at least10 times. The European Space Agency's Cluster mission has helped figure out howthese killer particles are created, which could help to better protect Earth'ssatellites and astronauts. Killer electrons ? this is what the scientists call them ? arehighly energetic charged particles that are trapped in the Earth's outer radiationbelt, which extends from about 7,500 miles to 40,000 miles (12,000 km to64,000 km) above our planet. As their name suggests, these particles areenergetic enough to penetrate satellite shielding, potentially damaging them. On Nov. 7, 2004, the sun blasted one of its many solar stormsin Earth's direction. The storm was composed of an interplanetary shock wavefollowed by a large magnetic cloud. The shock wave was detected by the joint ESA-NASA solarsatellite SOHO. When it passed by SOHO, the speed of the solar wind (theconstant flow of solar particles moving out from the sun), suddenly jumped from300 miles per second (500 km per second) to nearly 450 miles per second (700 kmper second). Shortly afterward, the shock wave hit the Earth'smagnetosphere, the magnetic shield that surrounds the planet and generallyprotects it from energetic solar particles. 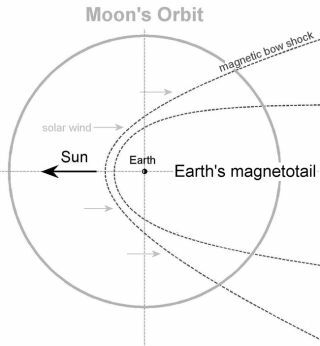 The impact from the shock wavecreated a wave front that propagated inside the magnetosphere at more than7,500 miles per second (12,000 km per second) at geostationary orbit (22,400miles or 36,000 km above the ground) around Earth. When the shock wave hit, the number of killer electrons inthe outer radiation belt started to increase too, as detected by instruments onCluster'sfour satellites, which sweep in an elliptical orbit around the Earth. Cluster's measurements have helped scientists choose betweenpossible explanations for how killer electrons are created. The two proposedpossibilities include electrons being accelerated by waves, with one methodrelying on very low frequency (VLF) waves, which are in the 3 to 30 kHz range,the other on ultra low frequency (ULF waves), in the 0.001 to 1 Hz range. It turns out that both types of waves are to blame. "Both VLF and ULF waves accelerate electrons in Earth'sradiation belts, but with different timescales. The ULF waves are much fasterthan the VLF, due to their much larger amplitudes," said Qiugang Zong fromPeking University (China) and University of Massachusetts Lowell, lead authorof the study describing the process. The study is detailed in a recent issue ofthe Journal of Geophysical Research. The Cluster data shows that a two-step process causes thesubstantial rise of killer electrons: The initial acceleration is due to thestrong shock-related magnetic field compression. Immediately after the impactof the interplanetary shock, Earth's magnetic field lines began wobbling atultra low frequencies. In turn, these ULF waves were found to effectivelyaccelerate the seed electrons provided by the first step, to become killerelectrons. Thanks to this analysis of Cluster data, if the killerelectrons happen to be ejected towards Earth, we now know that they can strikethe atmosphere within just 15 minutes. "These new findings help us to improve the modelspredicting the radiation environment in which satellites and astronautsoperate. With solaractivity now ramping up, we expect more of these shocks to impact ourmagnetosphere over the months and years to come," said Philippe Escoubet,ESA's Cluster mission manager.